Duo Primavera presented the acrobatic show "You and Me" on the vessel Costa Fascinosa. Gymnasts of the duo Primavera - presented new aerial act - duo on the air ring for the guests of the cruise ship Mein Schiff 3 . Trapeze artists on straps Inna and Oleksandr Aniskin - presented the aerial act in a theater on the cruise ship Mein Schiff 4 - the show "Variety". Artists Aniskin presented number an acrobatic the couple tango - the show "Variety" on the stage of the cruise ship Mein Schiff 4. Special thanks an choreographer Alessandro Conti and Roberta Rizzini for the wonderful idea. Air gymnast Oleksandr Aniskin presented a solo number on the straps at the theater cruise ship Mein Schiff 3. Duo Primavera - artists circus and an aerial gymnasts Inna & Oleksandr Aniskin from Ukraine, Kiev.It is the official site of duet. On the site you can to find all information about them. They are performing around of the world : circuses, variety, theaters, casinos, cruise lines, hotel, parks, shopping centers. 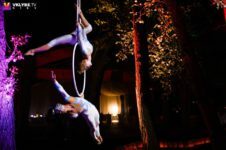 In this moment performers Aniskin can to present their acts both in duet so and solo, like : duo aerial gymnastics on the straps, gymnasts duo on the silks, air gymnasts duo on the aerial ring, solo male aerial gymnast on straps, solo female aerial gymnast on the ring, acrobatics adagio. Hope you will find all what need on the site and connecting us in the soon future.